Revel is one of the most versatile and customizable iPad POS solutions on the market. It’s feature-rich and suitable for any industry which offers a product or service. The focus on accessibility is also a fantastic and unique selling point, and it’s most suitable for medium to large businesses. 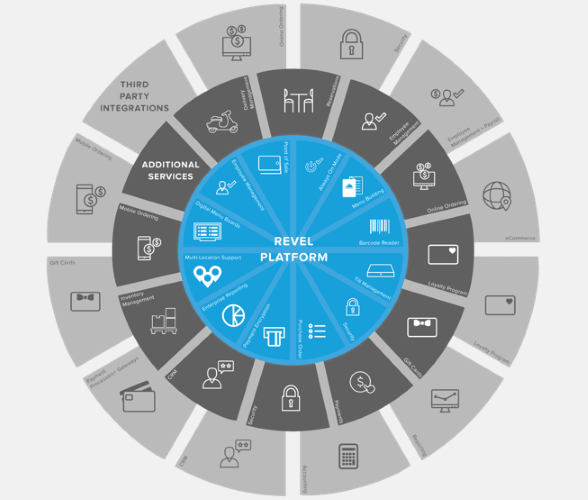 Revel uses an open API, allowing outside companies to develop programs that integrate with the platform or work alongside it to add functionality for business owners. Here are some of the most popular integrations, which can be added easily from the Revel app marketplace. One of the best things about Revel POS is that it is a completely customizable solution. They market their Point of Sale as suitable for any business which has a product or service. As a hybrid cloud-based system, it has all the ease and security of the cloud, but without the risk of losing connectivity when you don’t have access to the Internet. Revel is a great fit for restaurant and retail, as well as lesser served industries like cinemas, grocery stores and stadiums. Revel is best suited for larger operations, as the POS was designed to handle and help owners and managers communicate across multiple locations, with up to a half million SKUs. Now, just because the POS system works at the big box enterprise level doesn’t mean it won’t work for the little guy. Small to mid-size businesses can still work with Revel. In fact, a streamlined POS system like this, designed to make larger multi-site operations run efficiently, could be an ideal solution for a smaller operation trying to keep up with bigger competitors in their local space. Especially when you consider the abundance of applications and 3rd party add-ons that can be used to customize the functionality of the POS system to best fit your business needs. One thing to consider with a setup like this is that customization takes time. It would certainly work fine for a mom, a pop up shop or single location startup, but there are other options that take less time to configure and setup. A smaller restaurant or single location pizza place may not need all the bells and whistles, or advanced features that come available with Revel. Consider wasted functionality and the options you would actually use when comparing POS systems, and don’t shop based on feature set alone, unless you plan to scale up and grow to become a multi-site business in the very near future. Revel is designed for iPad, and offers an easy to use and intuitive interface. The step by step setup guides in the knowledgebase make it easy to get used to the functionality and train staff in minutes. Even more, Revel offers some amazing extras for ease of use. The Revel Accessibility App makes sure that even visually impaired users can make the most of the powerful Point of Sale by including Bluetooth keyboard integration, voice commands and large print text options. ‘Always On’ mode means that your business is up and running even without internet or during a power outage. The POS system has a wide range of functionality as well, and its intuitive interface means it’s extremely simple to deploy. The touch screen displays a product matrix including optional descriptions with a simple order list on the side. It’s extremely simple to enter discount and quantities as well as to select payment options. The interface is, in fact, so simple that it can be used in mobile businesses, kiosks, and even customer-facing displays so customers can make their own selections. There’s similar ease of use in the backend, as Revel is designed to streamline operations, making everything from navigation of inventory to employee management a user-friendly experience. There is a slight caveat to that: It’s not the type of back office system that is simple to use right out of the box. There’s actually a slight learning curve to understanding and remembering how to use all the advanced back office features. Don’t go into Revel thinking you’ll have this amazing business tool set up in a single day. With that said, a lot of the general functions you’ll use each day are fairly simple to navigate once you’ve gotten a feel for the system and you’re comfortable with it. The list of features Revel provides is extensive, with different options suitable for every industry, from retail and restaurants to cinemas, convenience stores and wineries. You can create a custom solution which suits your industry to the letter, with niche features such as cinema distribution compliance for movie theatres, or delivery management for pizza shops or florists. If you have a restaurant, innovative tools for restaurants include the ability to track the inventory of each ingredient in your menu so that you can easily restock and take orders tableside to send directly to the kitchen. For retail stores, Revel can be used to create matrix level inventory for different variations on the same product, for example colors and sizes. It also allows you to manage and track inventory in real time, and create gift card and loyalty programs. More general tools are customizable and suitable for any business. Mobile device management lets you manage multiple devices from any remote location and you can save time with analytics that offer intelligent reporting on your business progress. Another tremendous benefit of the Revel POS system is that it is a hybrid platform that functions both on and offline. This means that your POS system is always on and syncing with the cloud when an internet connection is available. If there’s any kind of service disruption with your internet service provider, Revel will continue to operate as if nothing happened. Once your connection is restored, the data will sync normally in the background. Payment authorization is still possible even when the system is offline. The POS will continue to take credit card payments and processing orders, batching everything together once your connection has been restored. There’s some risk to accepting cards without instant authorization, as they won’t be actually charged until after the customer leaves, but there’s a great benefit to zero interruption in handling customer transactions. Customers can access support 24/7 in a number of ways. Phone, email and live chat are all available from the website, and the support team will even remotely access your POS if they can help with any issues you’re having. If you’re more of a ‘sort it out on your own’ kind of troubleshooter, there is a thorough knowledge base with articles and tutorials on everything about the industry specific POS solutions as well as the custom options. Revel University is Revel’s website for training and videos. Industry specific packages are available from Revel depending on your business needs. The cost is flexible and per terminal. A versatile and customizable solution, Revel comes with a higher price tag than some other solutions in the industry. Whichever package you choose, you will have access to 24/7 live support, unlimited storage and security, integration with QuickBooks accounting software and unlimited software updates. While Revel doesn’t offer a free trial, you can request a demo to see exactly what you are getting before you commit. Payment processing is done through third party integration. Revel offers a long list of payment gateway options so you can choose the one that best suits your business needs. Most of them will allow you to take a wide array of payment options including credit and debit, chip cards, gift cards and mobile payments such as Apple and Android Pay. Revel also supports PayPal and BitCoins. The subscriptions at Revel are month to month, so they don’t require you to commit to a long term contract. If you want to cancel, you can give 30 days’ notice at any time. You will not incur any cancellation fees. Hardware integration is also third party, and often comes with manufacturer warranties of at least a year. Customer Service – It’s not easy to excel in customer service, especially when customers rarely talk to you unless they’re having a problem. The company reports a customer satisfaction rating of 93%, and while they haven’t always had tremendous customer support, they’ve shifted to a customer-centric focus that is making a difference in customer perception. Constant Quality Improvement – Revel has made great strides in improving its service offering. This included eliminating upfront licensing fees, expanded inventory options, and a bump in the technical support and customer service being offered. Versatility – POS systems come in a range of styles and designs. One of the things customers love about Revel is the expansive functionality of the cloud-based system compared to a more rigid and confining locally installed POS system. Always On – Revel pushes the benefits of its “Always on” POS system, emphasizing the importance of minimizing and eliminating service interruptions while you’re trying to run your business. Customers love it. Even when the internet drops you can continue to do business, taking cash and credit card payments. This is a major benefit for business, expanding operations that need to keep their head in the game and not worry about technical issues. Founded in 2010, the company quickly grew and reached profitability in just a year. Today they serve over 20,000 businesses including Belkin, Goodwill and Cinnabon.